When it comes to the Zika virus, there are two messages being spread: “the US will beat it and it will be a minimal problem here”, and “oh man, this is bad, it’s even worse than we thought, panic”. Which is right? The truth is somewhere in between: the US has money to fight Zika, screen for it, and spread the word. But the evidence says that things could potentially get really bad before we figure out how to fight either the mosquito most associated with Zika or the virus itself, and experts are sounding the alarm. 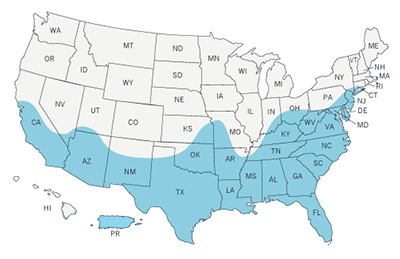 The CDC has released a map of the US with an updated for 2016 range for Aedes aegypti, the mosquito known for spreading Zika. At least 30 states have the mosquito, meaning those 30 states (mostly the SouthWest, South, and NorthEast) have the potential for Zika outbreaks. (And note: Europe is making the same evaluations, and facing the same fears). In addition to that, there’s Aedes albopictus, a mosquito with a much wider range in the US, and which could carry Zika, too. Both mosquitoes are potential sources for other tropical diseases, including Dengue Fever, Yellow Fever, and Chik-V.
Zika is hogging the headlines because the common symptoms are mild, and it’s spreading very quickly (many can travel while ill or don’t even know they are sick), while the severe symptoms can be devastating—anyone looking to (or accidentally) reproducing can infect the baby, leading to microcephaly. Everyone, but especially men and people with weakened immune systems, are at an increased risk for Guillain-Barre. Meanwhile, scientists are away in their labs, furiously testing the connection between Zika and these serious side-effects, it’s ability to jump between mosquito species, and more. It’s no longer just a correlation, there’s some pretty strong proof of causation in those petri dishes, and Zika is even more strongly virulent than suspected, leading to a lot of pressure for research into ways to prevent and cure it. What can you do while scientists, policy makers, and those downplaying the pandemic hash things out? Protect yourself and your home. Bug spray seems like it might be the answer, here. When West Nile was in the headlines the message was to keep still water around your property to a minimum. That’s still good advice! But Aedes aegypti is far more intrusive. It can live in your home, survive with far less water, and then happily infect you. It’s also active all day long, rather than just dawn and dusk, so you always need to be prepared when you go outdoors this summer (bug spray and long sleeves or pants, awareness of mosquito infested areas). Here’s the other catch: ability to fight mosquitoes is VERY uneven across the US. Counties right next to each other might have very different means to fight it (both in financial amount and actual methods). And in the past, many areas have focused on open spaces and wild areas to spray for mosquitoes, so those areas are likely more prepared—except, Aedes aegypti is more likely to hang out in our backyards and homes. There’s another thing you can do: support your immune system. Eat right, exercise, take advantage of summer warmth to get outside and boost your Vitamin D. And if you want an extra boost: support your immune system with colloidal silver. Do you think Zika will cause a big outbreak in the US? How are you preparing for the possibility? Previous post: Check Your Order!